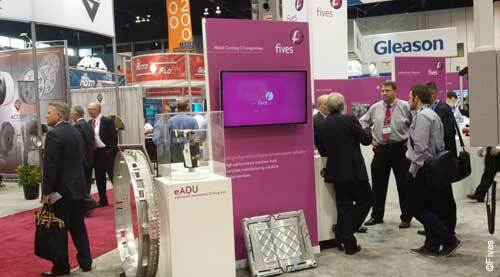 The place to be during the week of September 9 – 13, 2014 was Chicago at the 30th IMTS Expo. With over 114,000 registrants and 2,000+ exhibitors on hand, McCormick Place was filled all six days with innovative new manufacturing solutions and services. Fives displayed a refreshed brand identity at the show, promoting the new tag line “ultimate machines, ultimate factory” and combined four specialisms comprised of 11 brands to convey the organizations’ goal of providing complete solutions for today’s manufacturing needs. Grinding | Ultra precision unveiled the new Landis LTT cylindrical grinding machine in the booth, running a simulated grinding cycle showing the innovative use of twin turrets for grinding multiple features in a single fixturing. Metal Cutting | Composites displayed the Giddings & Lewis Y-axis attachment for vertical turning centers, an aerospace market display included models of the new eADU (enhanced Automated Drill Unit), the MGP bar machining center and customer parts from Cincinnati and Liné. Cutting Tools | Abrasives provided an impressive array of cutting and dressing tools and grinding wheels. Automation presented their offer through a variety of videos and onsite technical advisors. Fives welcomed a lot of customers, potential partners and visitors alike to tour the booth and know more about the Group’s offer. An in-booth VIP event was held Tuesday evening, September 9, to provide the opportunity for a more relaxed and casual interaction.